Born in Saguenay, Quebec, Marie-Nicole Lemieux is acknowledged as one of the leading contraltos before the public today. Her rich and rounded voice has introduced her to recital, concert and opera audiences all over the world. Following initial studies in Chicoutimi and Montreal, winning the Queen Elisabeth Music Prize in 2000 led to the start of an international career that has taken her to the stages of London, Milan, Paris, Vienna, Berlin and many more. 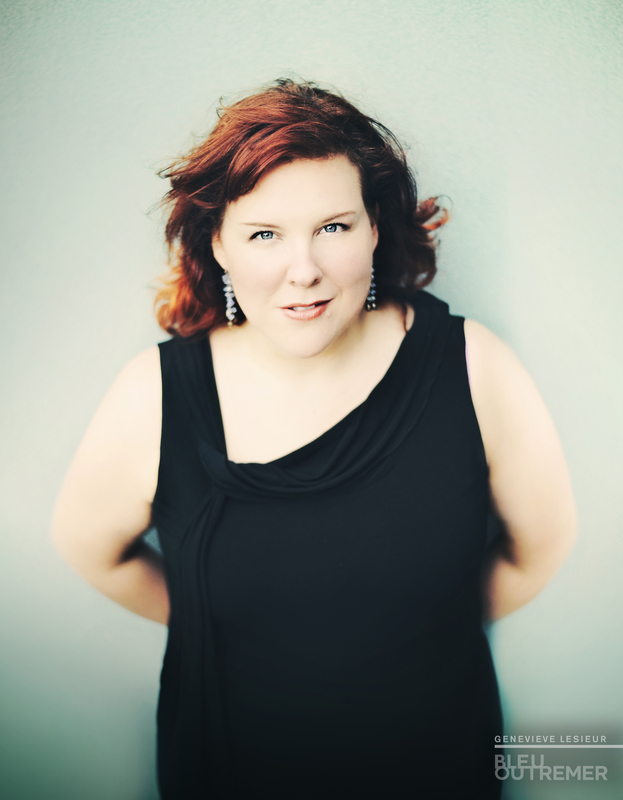 With a repertoire ranging from baroque to Rossini to Verdi and Penderecki, she is also known as a particularly fine recitalist and has a discography of almost 30 titles. Current and future engagements include Quickly at the Scala, Azucena at Orange, Ulrica in Zurich and Carmen in Paris. I caught up with Miss Lemieux between performances as la Sphinge in Oedipe at the Royal Opera House. Marie-Nicole Lemieux. Photo: © Geneviève Lesieur. Madame Lemieux, welcome back to London, England. You’re a regular visitor here having sung at all the major London venues including the Barbican, Royal Festival Hall, Wigmore Hall and now the Royal Opera House for the second time. How do you enjoy singing in London? I love this city. The only negative thing is not even the weather, because even when it rains there’s always something to do, but that it’s so expensive! I find the fashion and the museums here absolutely fascinating. Also, the Royal Opera house is a theatre I am so excited to have been invited back to sing at. Being invited to sing someplace is one thing but being asked to come back is very special. I find that throughout history this house has really maintained a standing of very high quality. The audience is knowledgeable – they recognize a singer’s musicality and voice and they know how to appreciate an artist. It’s so important for me to make a good impression here. The house is extremely professionally run with the best of the British way of ‘on time but with a smile’. It’s a pleasure to be back here and I was extremely happy to have been invited back. As you mentioned, I also sang at the Wigmore Hall and that was a very special experience – all the history in that place and being there was very exciting. I also sang at the Proms in 2010 in a program with Philippe Jaroussky. I always have a good experience singing in London. I have always been interested in Europe and my career has brought me here a lot. I find there’s a cultural tradition in Europe that we don’t have in North America. That said, not having that tradition in North America means that we have a certain freedom, we don’t have the weight of that tradition on our shoulders. In North America, if you want to do something you do it and you work hard towards it. I think that’s certainly one reason why we have so many singers who come from chez nous. That said, in Europe culture is part of society and it’s so great that young people can come to the opera for a cheap price and it’s always a pleasure to see young people in the theatre. You’re here to participate in this production of Œdipe. You have a crucial but short scene in which you are absolutely magnetic. How do you create your character in such a short space of stage time? This is my third production of the piece – I did it also in Toulouse and in Brussels in the premiere of this staging. That scene is a gift from Enescu. The role of la Sphinge spans two octaves in five minutes. The music is fantastic and all that I do vocally in that scene is written – the quarter tones, the voix blanche, everything is described in the score. Enescu is a bit of a control freak in fact. It’s true that it’s a crucial scene. I’ve always worked on my voice in an almost instrumental way. When you’re an instrumentalist and you play Enescu or Bach you do what’s on the page but you also have to have a sense of style, that’s how I see it. It has probably helped me that I’ve done a lot of baroque music but of course I have also sung Verdi too. I just do what’s written on the page and I worked together with Àlex Ollé to create the character. In Brussels I was a bit more animalistic whereas here, Àlex wanted to concentrate more on the dictator side of the character while still being an animal. I’m happy because Àlex has made a lot changes to things that in Brussels weren’t quite as clear for me and I think by clarifying things, it’s made the production stronger. So what you have here is a more mature version of the production. 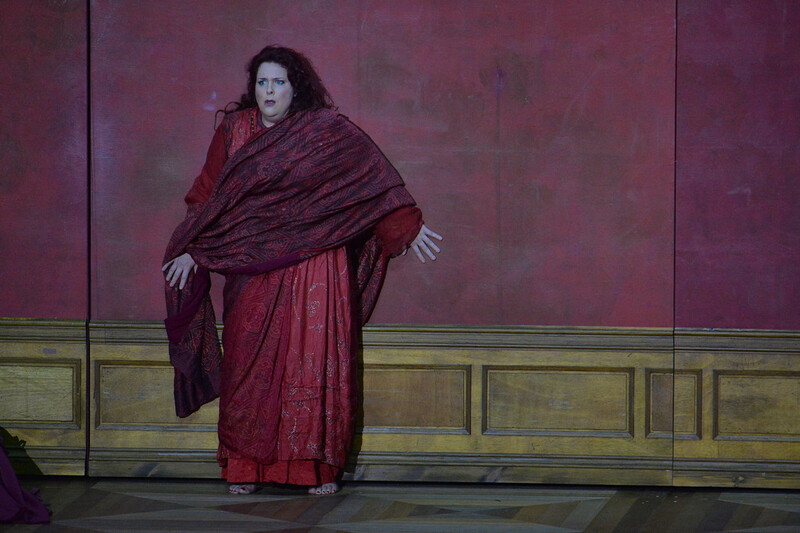 As Ulrica at De Munt – La Monnaie. Photo used with the kind permission of Miss Lemieux. Thinking of how you emerge from the dressing room, how do you launch yourself straight into a scene like that? It’s just like any other role. I compare it in a way with Ulrica, it’s very much the same kind of presence on stage. Ulrica isn’t a long role either, it’s just one scene, but the audience remembers it. What I do is that I warm up a lot more than I would for a role such as Tancredi where the voice has much more time to come together. Here, one has to arrive ready to launch into things. When I warm up I’ll sing through the role but without doing the effects just to make sure everything is in place, so that as soon as I get on stage, everything is there and we just go for it. I’ve done this role a lot so my body knows it. There’s no margin for error in a role like this. You might have read in some of my earliest interviews that when I was starting out, opera was one of the things I liked doing least. I started out as a recitalist doing a lot of concerts and I found it difficult to like opera because I found it hard to strike the right balance. When you’re a recitalist you can focus 100% on the text and its interpretation, you are the person telling the story completely. In opera you have to negotiate the staging and it took me some time to get used to that and to find the right balance to serve the work. When you’re singing in an opera you have to be careful not to get too caught up in the feelings of the character because that can stop the voice. So I found it difficult to enjoy opera at first but one learns to play a character on stage and now I enjoy it. That was actually my next question – the difference between singing recital and singing opera. In a recital everything comes from us – I love that, the storytelling aspect. There’s something quite intimate in the direct connection with people that you feel immediately. In opera it’s true that there’s a distance, there’s the orchestra pit between us, but you have to project differently. I’m not talking about the voice but more of the acting and the energy that you give off. You have to be conscious of the person right at the back of the theatre and that takes a lot of energy. Vocally, opera is often less tiring because you sing the same thing for a couple of months whereas a recital is demanding, it requires a lot of colours in the voice, it requires refinement, tension – it’s challenging but it’s also a beautiful experience. In concert with Philippe Jaroussky. Photo used with the kind permission of Miss Lemieux. You have a very wide repertoire ranging all the way from baroque to Rossini to Verdi, Mahler to Penderecki. How do you keep the voice flexible with such a wide repertoire? That’s it – keeping a varied repertoire. I’d like to believe that by doing lots of different styles one keeps the voice healthy. If I only sang Verdi or baroque I don’t think it would necessarily be better. In fact, at the time when I only sang baroque I developed some bad holes in the voice – one always has to be very careful not to develop them. Whenever I warm up for something I always do so with Mozart. Always. Singing Mozart always lets me know that everything is in place. At first I was considered a lyric contralto – I’m not a mezzo, even if I have the high notes, I can go up to a B-flat or a B-natural, that’s quite easy for me, but by nature I’m a lyric contralto. Would you also say it’s a question of colour too? Yes that too because I have a bright voice and I have always kept that brightness because it carries over the orchestra and carries the text. When I started singing as a girl, I started with chanson and for me the text has always been of great importance. I remember my mother telling me when I was a girl ‘I like it when you articulate the words’. Often my mother would say about singers ‘they sing well but you don’t understand a word’. When I sing, I make sure that the words are clear and often if the words are clear, it’s a sign that the technique is also good. The one composer that really opened up my vocal technique though, was Rossini. It took me a long time to like him, I found him insignificant at first. 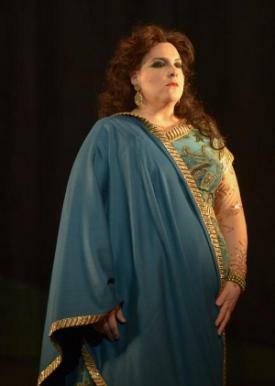 As Azucena at the Salzburger Festspiele. Photo used with the kind permission of Miss Lemieux. Because it’s so much about comedy. When I was younger all I wanted to do was just pour my heart out on stage. I was all about the sorrow and I was drawn to Mahler, Wagner, Brahms. I didn’t even like Mozart at first, I found him too light. When you’re young you don’t realize that laughter is profound but later one realizes that there is depth to the lightness that’s even more profound than serious music. This is something that comes with age and I discovered when I started singing Rossini that I really enjoyed it but he’s often sung in a way that I don’t like – just pulling out a top C for the sake of it for example. There has to be some feeling behind the line. Often when I heard bel canto I’d hear singers doing their tricks and I didn’t understand any of the words, that didn’t touch me. It was only later that I started to appreciate it and now I respect the artistry of being able to sing a good legato. Being able to sing bel canto requires an incredible ability to create sound and Rossini gave me the means to do this. This is why I have a Rossini album coming out early in 2017. What will you be including on that album? All of his tragic roles for contralto are male roles and his female roles for contralto are buffo roles. So I’ll be doing Tancredi, Arsace from Semiramide, Clarice from La pietra del paragone, Edoardo from Matilde di Shabran, Rosina and Isabella. There was no way I could do a disc of Rossini without including Rosina. Of course, I’ll be respecting the type of voice that I have so I won’t be doing lots of high squeaky noises but I’ll be doing some more subtle things. It’s funny because when I sing that program in public, Rosina is actually the first thing the audience asks for as an encore. 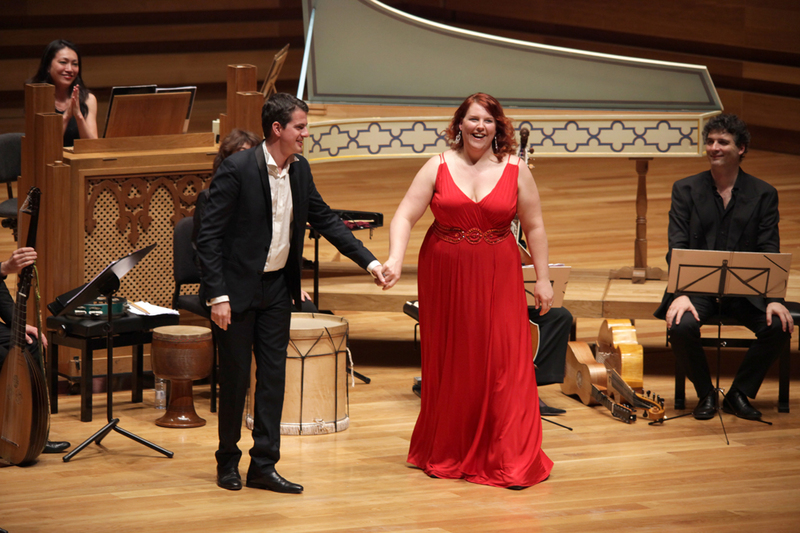 I’ll also be doing a couple of duets with my friend Patrizia Ciofi with whom I sang Tancredi in Paris. I think it’s going to be a nice album. As Mistress Quickly in Falstaff at the Royal Opera House in 2012. 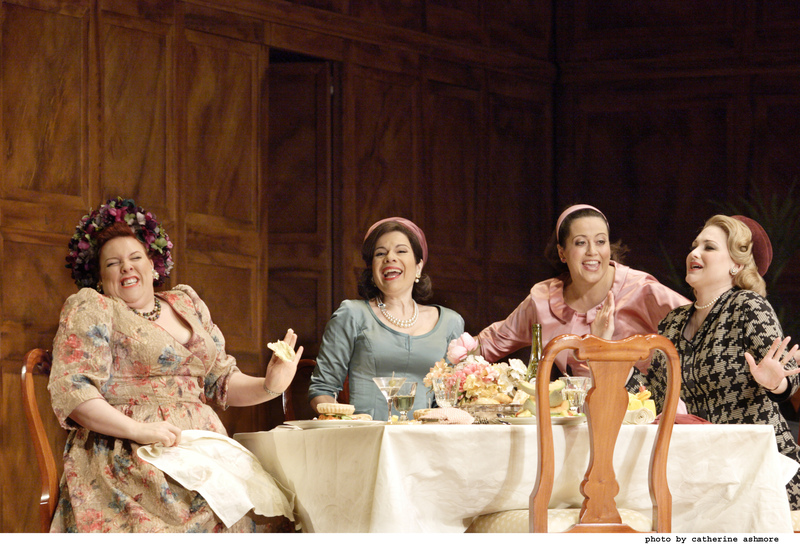 With Ana María Martínez (as Alice Ford), Amanda Forsythe (as Nanetta) and Kai Rüütel (as Meg Page). Photo: © ROH / Catherine Ashmore. You are one of the leading singers in an exceptional generation of singers from chez nous who are featured on lyric stages all over the world. Why do you think Quebec has produced so many excellent singers? I’m convinced that it comes from the way that we speak. The Québécois accent is very open and we almost sing when we speak. It actually reminds me a lot of Italy, another country that has also produced some great voices. We also have some great teachers. It’s true that per capita we do produce a lot of good singers. I have always enjoyed singing. At home both my parents sang but of course we started with popular music. My father was a lumberjack and he would go into the woods for a week at a time and his colleagues would always report back that he sang while working. So we started singing from a very young age at home. Then of course I went to mass and I would sing in the choir with Sister Clairette and at the end of every year we would do a big revue with an opérette. So singing, being on stage, both were there from the start for me. The classical voice came later. I was 10 years old when my father brought home a disc of Pavarotti and when I heard him sing the Sanctus from Berlioz’ Grande messe des morts, I remember it vividly – that was it for me. It was also a time where culture was part of the television schedules with programs such as Les beaux dimanches on Radio-Canada. I also recall seeing complete operas on television such as Traviata or Bohème with great singers such as Freni and Pavarotti. The first job that I had, I bought myself a CD player and bought a disc of Tchaikovsky and Rachmaninov, it was like a world had opened itself up for me. As I said, I have always sung but the voice that I had when I sang pop, I found it very uncomfortable to listen to, I found it ugly, I felt that it wasn’t my voice. Then when I had my first voice lesson and then when I sang my first classical recital, I was completely calm. It was like it was my true voice singing. There are sometimes singers who say that they discovered they had a voice but don’t really like opera and only listen to other things outside of work. I also listen to all kinds of music – dance, chanson. But the truth is I love opera and classical music – vocal and instrumental music – completely. As Dalila at the Opéra de Montréal. Photo: © Yves Renaud. Coming up from you we have your debut as Carmen in concert in Paris. We also have a return to the baroque with Handel. What other wonderful things can we expect from you? I haven’t sung Handel for such a long time. In a way I felt that I’d said good-bye to the baroque because during all those years where I sang so much baroque music, I felt like something of an impostor – especially when singing Handel. I found it difficult to sing Handel. Vivaldi on the other hand I felt needed an interpreter like me because if there’s no spirit to it, it falls flat. Handel is more instrumental and I always felt uncomfortable singing Handel coloratura, especially when I compared myself to other singers. That said, what I try to do is import some more personality into the coloratura, partly as a survival mechanism, but it also meant that people would tell me that I really brought something different to the music. I’m actually happy to be coming back to Handel because I feel that, thanks to Rossini, I’m in much better shape vocally and I think I can tackle him and feel more in control. I’m due to be singing Bertarido in Rodelinda on tour and it’s actually the only suitable role I’ve yet to sing in that piece. I recorded Unulfo with Alan Curtis and I sang Eduige on stage in Toronto so Bertarido was the only one left. Let’s turn to Carmen, what do you think you’ll bring to Carmen? Honestly, I don’t know yet. I always tell myself that nobody is ever happy with Carmen. 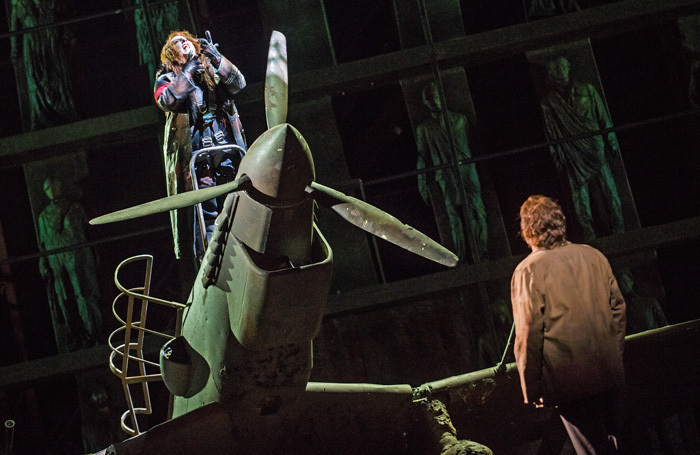 The music is fabulous – it’s a masterpiece – but everyone has their opinion about how to do Carmen. I’m slightly apprehensive about it but I’m going to be doing it in concert. I’ve dreamt for years of doing Carmen on stage but I’ve never been offered it so this might be my only chance to do it. I’m going to make sure that the words are there and that the voice is bright. One has a tendency to see Carmen as quite dark, she has a dark side but she also likes to enjoy herself and that’s why she dies in the end. The other similar role I have sung was Dalila in Montreal. I really have to do that on stage again soon – it was like a glove. 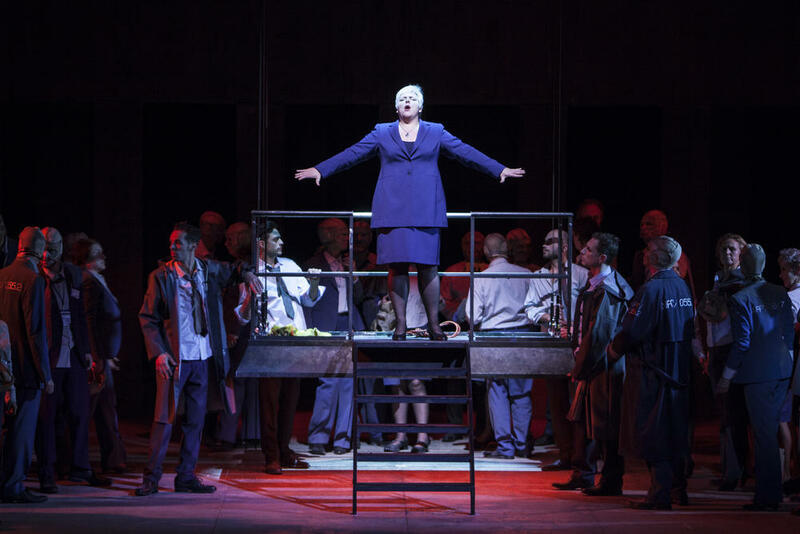 That’s a real contralto role, it’s deep – it’s fantastic. Singing Carmen is like a gift for me and I’m going to sing her with all my heart. With thanks to the Royal Opera House.